Sturbridge, East Brimfield and Westville Lake Park Ranger Tom Chamberland has been awarded the New England District’s “Interpreter of the Year” award. Tom was nominated by Buffumville Lake Park Ranger Jean Hixson, Chair of the Corps District Interpretive Committee. The Award was presented by Colonel Peter A. DeLuca Commander, North Atlantic Division Engineer on Thursday July 2nd, while on a visit to the New England District and Westville Lake. Tom’s nomination will now be presented to the Division level for consideration and if successful, forwarded to the National Level for the Hiram M Chittenden Award, The Corps of Engineers annual outstanding interpreter award. 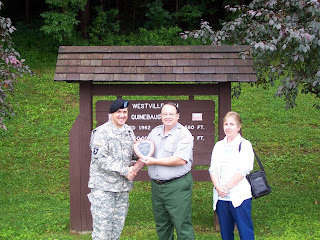 Photo: Colonel Peter DeLuca presents Park Ranger Tom Chamberland with the New England District’s Interpreter of the year award at Westville Lake, while Tom’s wife Diane looks on.